Media: Soft, glossy, colour covers; 25cm x 24cm format, printed on 112 good quality pages. Approximately 170 photographs, the majority in colour. Advantages: Superb quality colour photographs and useful operating squadron histories. First published in 2005, 'Lightning Force' is, to date, this publisher's only 'photographic appreciation' of a particular aircraft. 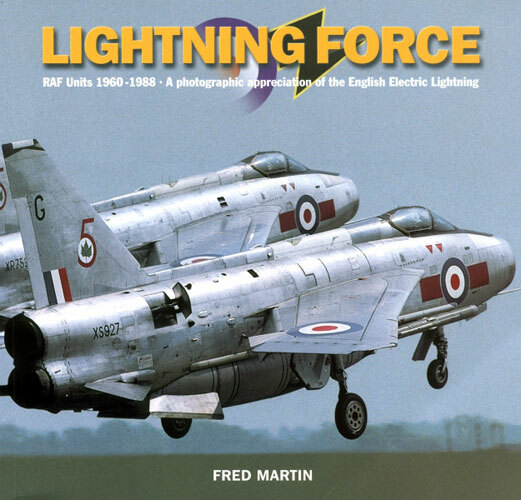 The author Fred Martin is a lifelong fan of the Lightning and has apparently been photographing military aviation since the age of twelve. Presented in an almost square format, the book is printed on good quality paper and is packed with superb colour photographs, augmented as necessary with only a handful of black and white images. The introduction is written by George Black (Air Vice Marshall, RAF Retired) and includes a photograph of all thirteen of 111 Squadron's Lightnings (led by him) in tight formation in 1965. The remaining ten chapters include nine on the RAF Lightning squadrons extant during the period (in order; No. 's 74, 56, 111, 19, 92, 23, 5, 11 and 29) as well as a final chapter on the training and second-line units. Each squadron's chapter begins with a two page description of the Lightning's arrival, introduction, operation and eventual withdrawal, each 'story' dependant on the squadron's role and ultimate fate. The first page of this text is printed on a dark grey/blue background, whilst the second page's text is backed by a black and white photograph of an appropriate representative Lightning. Also on the second text page, there is an illustration of each squadron's badge and a 'box-out', listing: the aircraft type flown prior to the Lighting's arrival; the variant(s) of Lightning flown (with dates); bases operated from and dates where applicable; date of disbandment; aircraft types subsequently flown by the squadron (to the date of publishing); and finally, a description of the squadron badge, motto and translation. Following each two-page introduction, the remaining pages in each chapter are devoted to the excellent colour photographs of that squadron's Lightnings in service. Most chapters have half a dozen or so pages of these photographs, but the last chapter on training and second-line units, boasts twenty. On the very rare occasion where colour is unavailable, a similarly high quality black and white photograph is used instead. 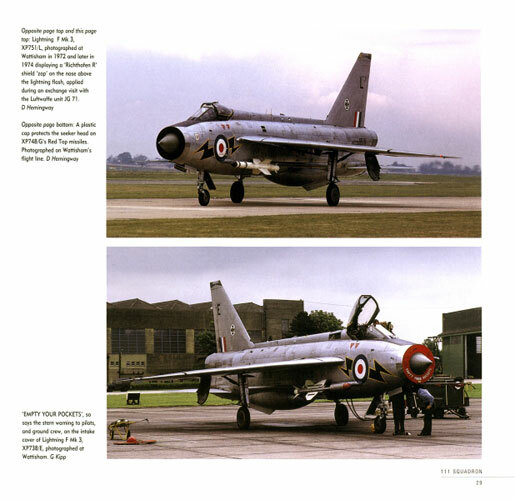 Two photographs per page is the maximum here (with a few dedicated to only one), thus ensuring that full justice is done to the high quality images on offer and allowing the viewer to study each aircraft in some detail. Indeed, if any modellers needed a reference for just how diverse natural metal finishes (NMF) are, they could do no worse than to purchase this book for that reason alone. Each photograph is captioned with appropriate information and even those not taken by author Fred Martin are of equally high quality. Apart from the few used to put his collection into context, 'none of these photographs have been published in book form before'. Although I have no particular desire to build a model of a Lightning myself, this aeroplane is still an evocative one for me. My first encounter with it came as a child during a family holiday to North Devon (UK) in the 1960's, when we attended an open day at RAF Chivenor. Probably the last time I witnessed one flown 'in anger', was at the International Air Tattoo at Greenham Common in 1976. The sight and sound(!) of a Lightning reheat take off is one not easily forgotten, especially when that aircraft then just sits on its tail and disappears vertically out of sight and up into the 'blue'! 'Lightning Force' certainly captures the essence of English Electric's most famous creation - you can almost hear (and feel!) the sound, and sense the heat and smell of 'cooking' airframe in this book. Perhaps my description is a little over-dramatic (maybe 'you had to be there'? ), but I'm sure modeller's will find a great deal here to whet their appetites and do their models justice. Failing that, any aviation enthusiast will find this a useful title, reminding us of the remarkable design which replaced the Javelin and protected these (and other) shores during the Cold War period.